Thirty-nine years ago, Linda Hetson ’03 began working at Akron Children’s Hospital as a medical secretary in pathology. For the second year in a row, 100 percent of the Social Work graduates who took the social work licensure exam passed! This is well above the national pass rate average, which is 71 percent. The Malone University Department of Spiritual Formation announces the release of Malone Worship Album, Volume 1, produced by 25th Street Productions, located on the Canton campus. Leaders at Malone University and Stark State College signed an articulation agreement today in a public event formalizing a more direct pathway for Stark State students to finish their degrees at Malone. The Ohio Foundation of Independent Colleges will induct Merv Yoder, a 1975 graduate of Malone, into its Hall of Excellence. 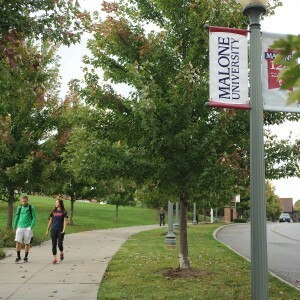 The National Science Foundation granted Malone University an award that will both advance scientific research in Ohio and later be shared with similar institutions throughout the nation. Affordable Colleges Online (ACO) , an authoritative resource dedicated to online learning and college affordability, has published its annual rankings of the Best In-State Online Colleges for the upcoming 2015-2016 school year. Nursing Schools Almanac, a web-based resource that provides rankings of U.S. nursing schools, recently selected Malone University as one of the top nursing schools in the United States. As Northeast Ohio’s Christian University, our motto at Malone University is Christ’s Kingdom First. Malone University President David King has been appointed to the Executive Committee of the Association of Independent Colleges and Universities of Ohio (AICUO).